When we look back at the first decade of the 21st century, it will be obvious that a few momentous changes in the business and computing landscape occurred. Of these, one of the most profound has been a decreasing emphasis on systems of record and the move towards what are called systems of engagement. Over the last 30 years, information technology has transformed the business landscape by capturing, structuring, and automated a growing percentage of the information that our businesses require to operate. This has offered a multitude of benefits to the organizations that have heavily invested in IT, not the least that information technology has been the one area where world class companies typically invest more than average performers. This is in contrast to finance, HR, or procurement, where the best companies usually spend far less than middle-of-the-road companies. However, in the last decade, a few industry observers have noted seemingly diminishing returns on the strategic value of technology to drive additional business value. In fact, towards the turn of the millennium, debates raged on whether IT had become just another commodity (or not) while the the gap continued to grow between companies applying IT well in terms of business performance and those who weren’t. As I pointed out in a recent post on organizing for social business, that the productivity gap looms ever larger. In a closely related trend, my colleague, well known business thinker Dave Gray, has been exploring how companies, becoming ever more global and conglomerated, experience dramatic productivity drops as they grow. This paints a discouraging picture for companies that have either not become digital natives or are dealing with the intense communication and collaboration overhead of today’s massive organizations: Better business performance is increasingly harder to come by as the easiest opportunities are seized. The reality is, however, that the vast majority of large organizations have been direct beneficiaries of decades of IT investment. To date, the bulk of that investment has been in a category of IT sometimes known as systems of record. These are the well-known bread-and-butter applications (and their databases) that run our firms and contain the business records, electronic documents, and countless other information artifacts that we use to conduct the routine minutia of daily business. It’s safe to say that most firms would go out of business without the data within and automated capabilities of their systems of record. But systems of record are increasingly 1) becoming commoditized by SaaS and the cloud and 2) most organizations have reached the carrying capacity of the approach: There’s very little left to store and automate that isn’t already. So where are new business gains to be had? Systems of record have matured to the point where there’s only a little strategic advantage to having your own unique capability. Instead, the discussion on strategic technology has shifted to the other 40% of what businesses in industrialized nations do: Knowledge work. These are highly variable, dynamic, and increasingly fast-moving processes that focus on the higher order activities of a business. Knowledge work involves high levels of communication and collaboration amongst the most valuable workers a company possesses. They are also represented in the most strategic activities taking place within an organization. Thus, using technology to enable knowledge work as a strategic capability has sparked a growing interest in improving what are increasingly known as systems of engagement. As a key part of this, the rise of social media in the middle of the last decade has done a lot to change the global focus on how we look at communication and collaboration between knowledge workers. A corresponding change came when technology innovation and rate of change in the marketplace began to outpace what most organizations could adapt to. This has led to the aforementioned generational shifts in focus, and in certain early instances industry disruption, in the way we apply technology to business problems. Witness what open source has done to commercial software or what the Internet has done to traditional media (music, TV, movies, newspapers, electronic gaming, etc.) to get a sense of what is now also happening to the information technology and communication industries today. For enterprises, ground zero for the transition to systems of engagement in many companies often centers around any pending update of the corporate intranet. Even today in most organizations, the intranet is much more of a system of record than it is a system of engagement. This is beginning to change and we can clearly see it in discussions that members have in the Social Business Council and in the initiatives that they are taking, which I’ll explore in coming months. What’s also clear about the changes taking place in businesses today is that systems of record are not going away. They’re a critical element of our business infrastructure and have their rightful place. Instead, we’ve discovered how we’ve often overestimated them and their ability to provide us with the tools to empower the most valuable and highest leverage aspects of our organizations. Watching what’s been possible on the Web, we’ve learned that we’ve correspondingly underemphasized the ability to enable and transform the most important element of business today: How we as humans can best work together to create value and achieve objectives. In last year’s survey of the social business landscape, I explored in detail the many emerging ways this is changing in the large and how enterprises are generally behind the times as the consumer world creates and proves out powerful new ways of tapping into and unleashing human potential. 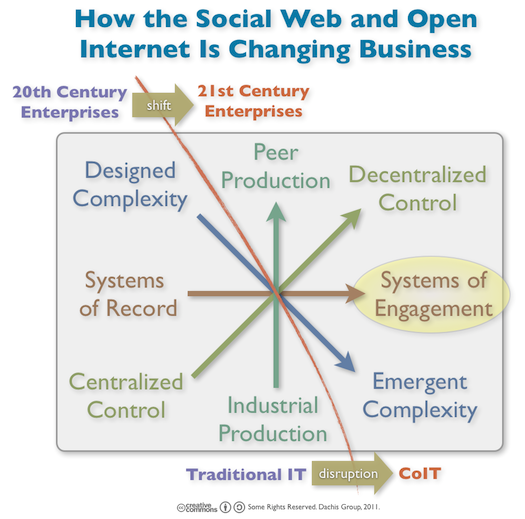 Enterprise 2.0, in the form of internal social networks and other models, are just the beginning here. New systems of engagement are now receiving considerable attention in the forms of online communities, crowdsourcing, Social CRM, open APIs, and many other means as a way to connect customers and business partners together to achieve useful outcomes with the most cost-effectiveness and largest result. From just one recent example of many of this trend, this week Gartner reported that “within five years we expect that community peer-to-peer support projects will supplement or replace Tier 1 contact center support in more than 40 percent of top 1,000 companies with a contact center.” Social systems of engagement have already become the primary way that we communicate in our personal lives and this is also happening for businesses. In recent conversations around how IT is changing, it’s been clear that this is part of a larger trend, part of it the move from push to pull systems, part of the move from the center to the edge, but all of it shows how networks and simple, freeform, emergent tools can enable much bigger results than the transactional systems of old. If you are investing in strategic new technologies today to drive your business forward, I believe this is one of the most important investments you can make at this time. Make no mistake, however, that this is very much an unfolding story and we’re all learning from watching the leaders. But as I’ve covered here and many times in the past, it’s a change that very few organizations will be able to skip and survive. 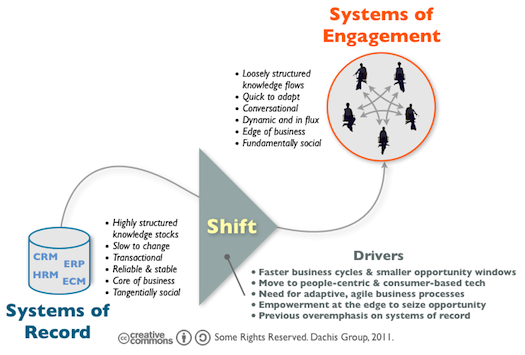 I’ll be exploring systems of engagement in more detail as part of my Why Social Business Is Different series. Stay tuned.